We have put our outdoor pizza oven to the test! I do believe it is ready for friends and family now. Of course Alex's girlfriend and another friend were our first testers! he said it passed his approval. I will tell you it was a lot of trial and error..
My MIL in Buffalo sent us an outdoor pizza oven book and we tried out a recipe last night. Carmelized onions and blue cheese, just that simple, but OH so good! I just had the last piece today, COLD, and it was delish! come on over..only takes 3 minutes. Thrift store chair started the Fall decor door area! this time near the door. I feel like Dr. Seuss! Near the house?, on the house?, no it is not a mouse, you must come and see! It started with this little $8.00 thrift store chair I scored at our local humane society. I have told you before I love checking them out at least once a month. I loved the little size of it, and I knew it was a sturdy solid wood chair. Had potential, but exactly what was I going to do? So with this chair, I have created an entire Fall vignette outside our mudroom. I painted it with my little itty bit left of ASCP Arles color. Added a few pumpkins,cabbage plant, and a little hay for the Fall effect. Notice I have wrapped some burlap around the plant? Last of the burlap too. Debbiedoo's supplies of paint and burlap are officially GONE! I don't think I have anything more to paint at this point...unless I move onto humans! My first little green pumpkin..what a cutie! And there you have my mudroom outdoor door decor and more. and as always your time and sweet comments. (5) $100 Dollar giveaways, you do NOT want to miss! Some may know my blogging friend Liz! For those of you who do not know Liz, I urge, I mean urge you to go meet her today! Not only is she sweet, a great decorator , and oh so cute, Liz is also very generous and is having an amazing giveaway! That's right...she has 5 different drawings at $100.00 each! Ok, so to be honest this Fall wreath was not as easy as the other one! Seriously, the other one was just a throw in to show you how easy a wreath could be if you only have a minute to spare and want to spruce up a door. there was a tad more thought put in to.. Ever since I hung the Christmas wreath in the window last year, I like the look of having a wreath per season, at the holiday time especially. natural elements on my rustic wreath. I scared the heck out of one of my neighbors when I popped out of the woods...I apologized of course, but I was on a mission to find just the right stuff! Cinnamon sticks from my pantry. The little squirrel and owls I bought at Michaels. I can't wait for the leaves to change. I think all the colors will be so delightful to look at with the wreath as well. hey ,hey ,hey there, sorry I am late. Been a crazy hectic weekend if you been reading. Glad to have you here this week for the newbie party. Finally my Fall mantel is complete! I took some different elements from my inspiration a few weeks back you may recall. I loved the live greenery, which I have a plenty of in our backyard. And I loved the twigs which I have had this vine for years and never used it. This stuff (vine) is not fun to work with, finally figured it out! Also, this old sessions clock is always a decorating dilemma. You see my husband loves this clock he purchased off of ebay several years ago. The one time I moved it to decorate the Christmas mantel, the leg broke. Since then, I am forbidden to move it. you know I am not a sparse person! Look I have my white pumpkins...FAUX of course, I could not wait another second! Our family room is ready for Fall! 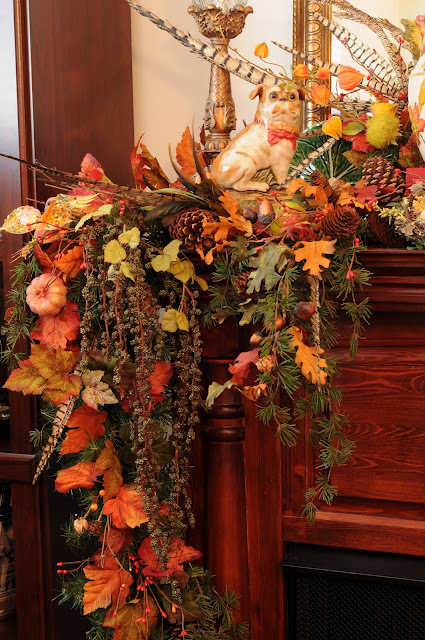 Although, I am just showing this to you now, I have had my Fall mantel up for a while, so we did get to enjoy it. Halloween is my fun one! Blogging 6 months or less, and/or less than 100 followers. Love for you to be a friend of mine on google friend connect on my right hand side bar. PLEASE, turn off Word verification...big time comment deterrent! Please add my link or button to your blog or post. IF you find you LINK is gone, go back and read my guidelines...thank you. First off, a HUGE thank you for all of the well wishes and good luck to my son Alex! Fort Mill band came in 1st place yesterday, pretty impressive for their FIRST competition. The field conditions were awful as you can see! Kids were slipping and sliding all over. The dirty knee is actually not because they fell, they had to kneel at one point. It was a very, very long day. All the bands participating did a phenomenal job! However, Fort Mill out shined them according to the judging. We rolled in around 2:30 am, so needless to say not a lot of UMPH! today. This year with my Fall decorating, I wanted to bring more outdoor nature indoors. As you know we have a beautiful tree filled back yard. I made a wreath this year,and I can't wait to share it with you. It of course was inspired by the great outdoors. What do you think about decorating with natural elements opposed to faux? Don't get me wrong, I love my faux here and there, but honestly, I over did it many years back, as I tend to do sometimes. I tend to shy away now from not so much. See you all later on for the NEWBIE party! I see a lot of you gals are getting the hang of this blogging thang! Thank you for turning OFF word verification. I even see my friends out here telling you to turn it off! thanks all, we will all get the hang of this sooner or later.